Eat all chocolate off the sides. Eat all chocolate off the top. Eat all chocolate off the bottom. Khloe rightfully points out that this is actually just two steps—eat the chocolate, then eat the peanut better—but, for the sake of following Kourtney’s method as precisely as possible, I broke down my attempt in the number of steps she provided. Sorry, did I not mention I tried Kourtney’s method? Because I tried Kourtney’s method. 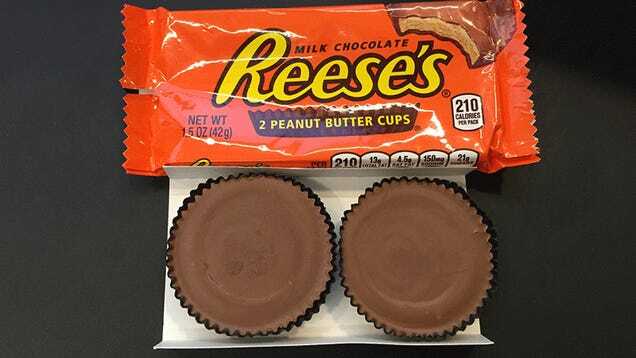 It began with a Reese’s Peanut Better Cup. I bought a package of two for one dollar. A perfect package of candy. I normally prefer eating these bad boys cold, but because I didn’t feel like waiting for them to cool in the office fridge (and because I sort of expected them to disappear left there), I quickly completed step one. As a technical process, step two (eating all the chocolate off the sides) was easy. As a mental test, it was rough. 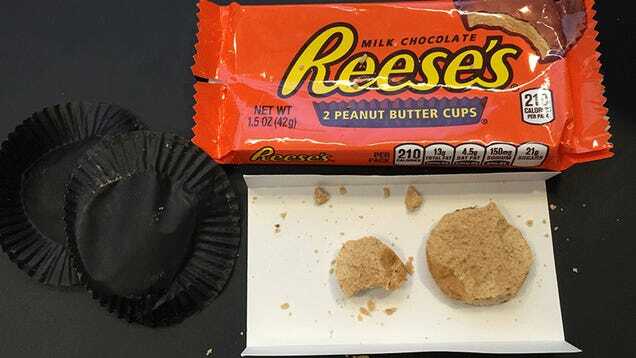 I’m used to devouring Reese’s Peanut Butter cups in three or four bites, not like some kind of patient mouse—but I managed. Next came the tough parts. 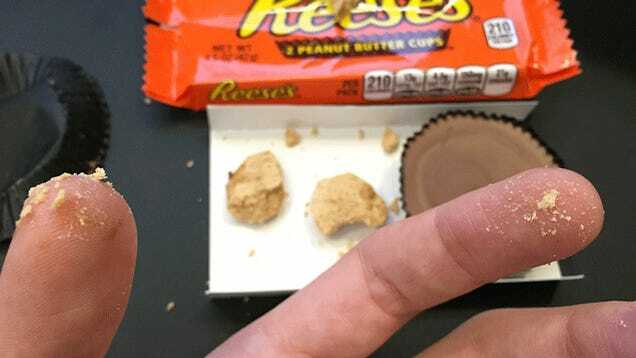 Because of the increased peanut butter-to-chocolate contact on the top and bottom layers, as well as the lack of a sizable edge to latch onto, peeling the thin layers of chocolate off the peanut butter with my teeth proved more difficult that I had expected. And, unused to eating chocolate with this kind of precision, I slipped and broke my peanut butter patty in two in the middle of step four. With only one shot left at success, I prepared with a few deep breaths and visualized myself as a Kardashian sibling named Kobby. Kobby can do this. Kobby can do anything. Kobby is ready to eat a Reese’s Peanut Butter Cup like his big sister Kourtney. Now came step five—eating the peanut butter. Back in the day—maybe 1999—I made homemade Reese’s after watching a recipe from the kids on Zoom. The secret to getting the peanut butter to taste like the Reese’s peanut butter, they (I think Zooey? Maybe Jared?) said, was to mix it with powdered sugar. I remember tasting it in my parents’ kitchen and being sort of overjoyed by how good it was. But when stripped of its chocolatey clothing, this patty tasted more like peanut butter and wood shavings—a dry, mostly flavorless hunk of crumbly tan that was so unpleasant in my mouth that I forgot I was eating candy. Why would Kourtney tell us to do this, let alone do it herself? Combining chocolate with peanut butter is one of the best things humankind has ever done, so why tear the two apart for the sake of prolonging the experience of eating something sweet? But unlike pain, heartache, or tears, no good can come from exposing peanut butter from its chocolate mask. Just like no good can come from following Kourt’s advice for eating candy. Images via Kourtney Kardashian, the author.